Lord Mayor Clover Moore officially launched the countdown to the start of Sydney’s Chinese New Year Festival on Monday February 12th – the largest celebration of the Lunar New Year outside of Asia. The City of Sydney’s festivities kick off with an opening night fireworks display on 16 February together with Sydney Harbour Bridge glowing an auspicious red for 10 consecutive nights. The spectacular start to the Year of the Dog also includes unveiling the Lunar Lanterns exhibition at Circular Quay, with giant artworks representing the 12 signs of the Chinese zodiac. The Lord Mayor said the city-wide celebrations this Lunar New Year are an opportunity for all the community to come together in harmony. “The Lunar New Year is a fantastic way to highlight and celebrate our Chinese, Korean, Japanese, Vietnamese, Indonesian, Thai and Australian cultures in Sydney,” the Lord Mayor said. Around 1.4 million people are expected to join in Sydney’s 22nd Chinese New Year Festival that run from 16 February to 4 March and includes everything from art exhibitions and food events to live performances and dragon boat races. As part of the Lunar Lanterns exhibition, the City unveils five new lanterns this year. An animated dog lantern features on the western broadwalk at the Sydney Opera House. A pig lantern with 1,000 individual pigs is at Cadman’s Cottage in The Rocks. A colourful 13-metre tall dragon lantern sits on the front lawn of the Museum of Contemporary Art. A huge resting tiger sits atop a Circular Quay ferry terminal. And two 3.8-metre-tall dog lanterns guard the entrance to Dixon Street Mall in Chinatown. Designer of the dog lantern at the Sydney Opera House, Chinese–Australian artist Song Ling, said the new dog lantern is based on traditional designs and inspired by his beloved pet. “The most significant quality in dogs is their unconditional companionship and loyalty. Their energy can be passed on to us, with a special kind of warmth – as if they understand us more than we know ourselves – and I brought this feeling into my creation,” he said. The Lunar Lanterns exhibition, from 16 to 25 February, runs along Circular Quay from the Sydney Opera House to the Overseas Passenger Terminal, with the addition of two dog lanterns in Chinatown. Chinatown will come alive with a host of enchanting sights, sounds and taste-bud-tingling smells in celebration of the Lunar New Year. From lion dancers to food and art tours across Haymarket, a variety of unique celebrations will transport visitors to the charm and magic of traditional Chinese culture. More than 200 performers and international delegates will feature in the festival, taking part in traditional, contemporary and folk dances, choral performances, martial arts and lion dances. The performers in the impressive line-ups have Australian, Chinese, Japanese, Korean, Thai and Indonesian heritage. Upwards of 3,000 paddlers from across Australia will take part in the annual Dragon Boat Races on Saturday 24 and Sunday 25 February. In the biggest dragon boat race in the southern hemisphere, the two-day regatta consists of more than 100 races running every 10 minutes each day. The races incorporate sports and corporate club races, charity races and WSFM’s Jonesy and Amanda who will compete in their own celebrity dragon boat race on Saturday. The city charity partner for the Chinese New Year Festival, Guide Dogs NSW/ACT, will run several events as part of the festival. More than 80 associated events will offer celebrations of the Lunar New Year, from a traditional tea ceremony at the Art Gallery of NSW and congee breakfasts in Chinatown to art exhibitions and a Chinese opera demonstration. The Sydney Opera House’s Concert Hall stage will feature leading Chinese and Australian singers and musicians in East Meets West – Chinese Lunar New Year’s Eve Gala Concert and Treasures of a Nation, a performance by the prestigious Chinese Orchestra of China National Opera and Dance Drama Theater. • A spectacular display of 12 giant lanterns, depicting the 12 signs of the Chinese zodiac, will grace the foreshore around Circular Quay, from the Sydney Opera House to the Overseas Passenger Terminal for 10 days and nights. • Lunar Lanterns is a contemporary take on a centuries-old tradition, with some lanterns standing up to 13 metres tall. • A free celebration of culture, community and friendship. Performers from a wide range of community groups will take to the outdoor stage with traditional and contemporary performances at First Fleet Park in The Rocks. • Groups specialising in choir performances, opera, classical music, fashion shows, tai chi and kung fu are sure to delight. • Featuring the best of community performances, the Lunar Spectacular Show is a one-hour curated program that showcases traditional Chinese, Thai, Indonesian, Japanese and Korean dancing; Japanese hip hop; Korean drumming; the Chinese New Year Festival Dancers; and stilt walking. • Chinatown will be transformed into a thundering lion den with traditional lion dancers and red firecrackers. • Step inside the AYAM tuk tuk and play Zodiac Roulette, which uses world-first technology to discover your ideal Asian dish, matched to your combined Chinese and western Zodiac signs. • A host of events include the Chinese Youth League’s Cantonese Opera Demonstration and Seminar, Chinatown’s cuisine and local art in 4A Night Walk and Art Space, a cinematic experience with Chindia: Short Films from the Diaspora, and one of the many Chinese banquets on offer. • Shoppers can step into a virtual reality world with the World Square Dragon’s Tail Augmented Reality Experience and Red Treasure Hunt. • The Friday night Chinatown markets on Little Hay Street will offer everything from yum cha and teppanyaki to takoyaki and green-tea flavoured desserts. • One of the country’s leading physical theatre companies has teamed up with performing artists from Korea for the Australian premiere of the aerial theatre show, Frameshift. • The free contemporary art performance will take over Customs House Square on 16 to 18 February, as part of the City’s year-round celebration of art in unusual places, Art & About Sydney. • Performers blend breakdancing and aerial manoeuvres across a 15m high scaffolding structure and circular track transformed into a dance playground for the contemporary production. • Thousands of paddlers from across Australia will take to the waters for the annual races on Cockle Bay at Darling Harbour for the biggest dragon boat race in the southern hemisphere. • The 12m long boats are decorated to feature the head and tail of a dragon – each vessel is armed with 22 rowers, including a drummer to inspire the rowers with a rhythmic beat. • The two-day regatta consists of more than 100 races running every 10 minutes each day and features sports, corporate and charity clubs races. • A delegation of 22 performers from Henan province will entertain crowds over the weekend of 24 and 25 February on the Community Performance Stage at First Fleet Park in The Rocks. • The delegation comprises of three performance groups – Shaolin monks exercising kung fu, a traditional folk music band and a dance group. The delegation is organised by the Provincial Ministry of Culture. • A graduation ceremony for three dogs-in-training that have made the grade and are about to become guide dogs on 17 February at 5.30pm on the Community Performance Stage at First Fleet Park in The Rocks. • A Guide Dogs NSW/ACT model dog art installation, comprising 70 life-size model dogs decorated by artists, will be on display at Scout Place (outside the AMP Building) and Customs House, Circular Quay from 16 to 25 February. Visitors can vote for their favourite painted dog with a gold coin donation. Following the exhibition, selected dogs will go under the hammer at a charity auction to raise vital funds for Guide Dogs NSW/ACT to assist people who are blind or vision impaired. • Guided tour of the Lunar Lanterns for the blind leaves from the model dog art installation at Scout Place (outside AMP Building) at 7.30pm on 21 and 22 February. • More than 80 associated events across Sydney will offer celebrations of the Lunar New Year. These include singing karaoke at the top of the Harbour Bridge, to tea ceremonies, exploring the moon at Sydney Observatory, lantern workshops, photography exhibitions, performances, kids’ events and tours. • With some of the world’s best Asian restaurants to choose from, Sydneysiders will be spoilt for choice with special celebratory dishes served alongside an array of year-round favourites. • Festive snacks for Chinese New Year Festive are being offered by Gelato Messina, Din Tai Fung, Ladurée, AYAM, Koi Dessert Bar, Monkey’s Corner and Black Star Pastry. • The Sydney Opera House’s Opera Bar is offering steamed scallops with lemongrass, ginger & soy ($24 for half a dozen) + prawn and sesame toast, chilli dipping sauce, costing $15. Then there’s Portside Sydney for Shanghai braised pork belly with steamed fragrant rice, served with a glass of wine at $20. Or try The Lounge for a selection of chicken and mushroom, prawn or vegetable dumplings for $13. A heartbreaking story of a loyal companion is the inspiration behind the magnificent Dog lantern that will sit next to the Sydney Opera House for the 2018 Chinese New Year Festival. The new animated Dog lantern at Circular Quay will form part of the spectacular Lunar Lanterns display featuring art installations for 12 signs of the Chinese zodiac across the city from 16 to 25 February. Artist Song Ling revealed the tale about his dog A-hei when describing the inspiration behind his 10-metre tall lantern for the Year of The Dog. “This Dog lantern design has traditional colours and shape and is inspired by my beloved pet,” he said. Mr Song, then 27, took in A-hei when he was two weeks old. Due to economic hardship in China at the time, his family had only one small bottle of milk a day, which they shared with A-hei. The young street puppy fast became part of the family, bounding to the door to welcome Mr Song home after work. “This excited little puppy gave me so much love and warmth. Every night, A-hei would sleep under my bed and I would chat to him and pat him to sleep,” Mr Song said. He kept A-hei safe inside his apartment for eight months until he took the opportunity to move to Australia. Since leaving his dog in China and moving to Melbourne, Mr Song has not had the heart to look after another dog, as he has missed A-hei too much. Mr Song created the fibreglass Dog lantern in memory of A-hei, giving it a wagging tail and a tongue that sticks out. It has been decorated with an inkwash paint finish, taking on traditional Chinese folk art colours and shape. “The most significant quality in dogs is their unconditional companionship and loyalty. Their energy can be passed on to us, with a special kind of warmth – as if they understand us more than we know ourselves. I brought this feeling into my creation for this year’s lantern,” he said. Lord Mayor Clover Moore said the City of Sydney is proud to host 12 lanterns representing the Chinese zodiac at Circular Quay. “With fireworks, lion dancing, dragon boat races, performances and fabulous food events across the city, there is something for everyone to enjoy this Chinese New Year,” she said. The Lunar Lanterns were designed by 12 internationally acclaimed Asian-Australian artists, depicting the 12 signs of the Chinese zodiac. The four new lanterns were all designed by critically acclaimed artists for the 2018 display – the Dog, Pig, Tiger and Dragon, The Pig lantern – an interactive new zodiac lantern featuring 1,000 squishy pink pigs reaching for the sky will also be a hit with families this Chinese New Year. The lantern consists of a six-metre high silicone spiral of 1,000 pigs, lit by LED lights, hat kids can touch and play with. John Deng, a Goulburn-based architect and artist for the Pig Lantern, says he was inspired by childhood memories growing up in rural China and “tried to capture the cuteness of a pig” in his work. Reaching almost 6m tall and 12m long, the lantern will be located at the Cadman’s Cottage forecourt at Circular Quay and is made from 100% recyclable silicone. Claudia Chan Shaw, curator of Sydney Chinese New Year, said the lantern “is likely to draw plenty of attention from children and leave them wanting to take a pig home”. Thirty-five young Sydneysiders will wow audiences with a white and green flower dance combining contemporary movement and classical ballet as part of Sydney’s Lunar New Year celebrations. Jasmine Flower, directed by international dancer and examiner Lucy Lu, takes place on 17, 23 and 25 February at the festival stage at First Fleet Park in The Rocks. Eleven-year-old performer Kitty Jiang, from Hurstville, who will dance alongside 34 other children for the work, said it was a privilege to help celebrate the City of Sydney’s Chinese New Year Festival with her friends on stage. The Jasmine Flower dance is based on a Chinese folk song with the same title, dating back to the 18th Century –gaining popularity in China and overseas. The performance for Sydney Chinese New Year involves local children aged 6 to 11, who were selected from 250 students at St George Academy of Performing Arts in Hurstville. Jasmine Flower director Lucy Lu is an international dance examiner with the Royal Academy of Dance in the UK who has organised performances for Sydney Chinese New Year for 15 years. Ms Lu, who now lives in the St George area, won a scholarship after beating 10,000 students to one of 20 places at Shanghai Ballet School at the age of 10. From this boarding school scholarship – with all accommodation, food and study paid for by the government – Ms Lu’s glittering career as a professional dancer, teacher and examiner began. Ms Lu was a professional dancer in classical ballets such as Swan Lake, The Nutcracker andRomeo and Juliet and a solo dancer in many performances in the 1980s and 90s. Ms Lu brings her experience as an examiner into her St George Academy of Performing Arts studio when she teaches children. Lord Mayor Clover Moore said the children’s performances are always a very special part of the Sydney Chinese New Year Festival. Ms Lu has taught ballet and Chinese folk dance since 1994 when she was just 17. After being a professional ballet dancer for 10 years, Ms Lu became a teacher at the Royal Academy of Dance for a further 10 years before becoming an examiner in 2015. She now travels all over Europe, North America, Asia, Australia and New Zealand examining dance students several times a year for four to five weeks at a time. Examiners often continue until they are 70 to 75 years of age, and Ms Lu would like to be an examiner for as long as she can. Teaching children from age three to adults, she sees plenty of up-and-coming talent. “I like examining in Japan and Australia, and I really enjoy my role as an examiner. I love the domestic tours in Australia as the candidates prepare very well and it’s wonderful to watch,” she said. Join us in this free celebration of culture, community and friendship. Performers from a wide range of community groups will take to the outdoor stage with traditional and contemporary performances at First Fleet Park in The Rocks. From 5pm, groups specialising in choir performances, opera, classical music, fashion shows, tai chi and kung fu are sure to delight. Featuring the best of community performances, the Lunar Theatre Show is a one hour curated program that showcases traditional Chinese, Thai, Indonesian, Japanese and Korean dancing; Japanese hip hop; Korean drumming; the Chinese New Year Festival Dancers; and stilt walking. Take a short stroll around Circular Quay to discover 12 larger-than-life animal signs of the Lunar zodiac. Explore the Lunar Lanterns from Friday 16 February to Sunday 25 February. The Lunar Lanterns are a creative, contemporary interpretation of a centuries-old tradition. Exclusively designed by Australian artists, with Festival Curator Claudia Chan Shaw, the Lunar Lanterns tower up to 13 metres tall. Marvel at modern technology blended with classic Chinese techniques as these magical lanterns light up Sydney’s harbour. Find your zodiac sign, catch a live performance by our community groups or simply enjoy summer in Sydney in a unique celebration of the Lunar New Year. While you’re there, stop by Museum of Contemporary Art’s pop-up Colour Fields bar. It’s open until Saturday 24 February. Download the Sydney Culture Walks app for a fun, easy way to navigate the festival and Lunar Lanterns. Explore the 12 Lunar Lanterns at Circular Quay during the Sydney Chinese New Year Festival. The Lunar Lanterns will be illuminated from dusk each day, however they can be viewed in daylight. This is one Sheep that will stand out in a crowd! The Sheep Lunar Lantern takes the form of a giant Merino ram. The Merino is an Australian icon, immortalised in Goulburn’s Big Merino, the jolly jumbuck in the song Waltzing Matilda, Tom Roberts’ painting Shearing the Rams and the logo for Golden Fleece petrol. This majestic, woolly character is kindhearted and noble, and as can be seen from his impeccable appearance, has excellent taste. 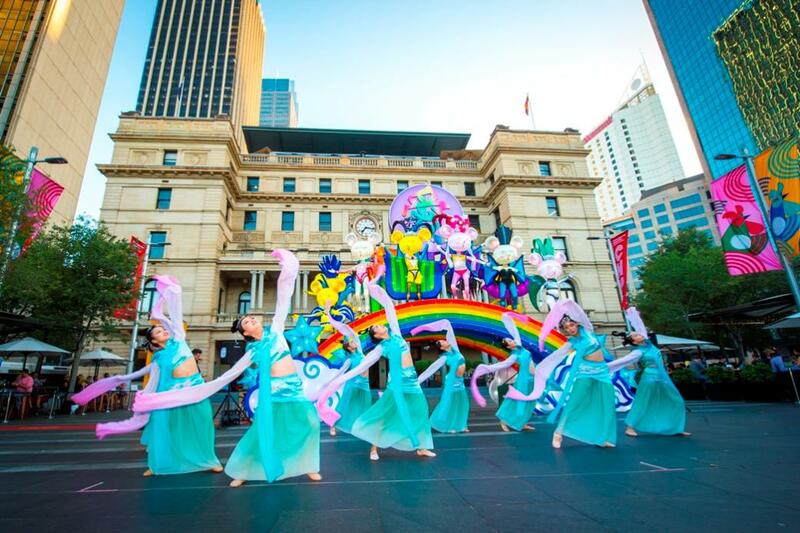 Alexandra Sommer and Brad Clark are graduates of NIDA who have collaborated on 7 consecutive Chinese New Year celebrations with the City of Sydney. They have designed parade floats, costumes and delivered such projects as the Dragon Ball at Town Hall in 2012. They have worked on the Lunar Lanterns exhibition since it began in 2016. The zodiac symbol of the Sheep can be characterised as tasteful, warm and intuitive. The sensitive Sheep offers a quiet life of creativity and compassion. This lantern represents happiness, wealth, peace and prosperity. In Chinese culture, the tiger incites both awe and admiration for its prowess, ferocity and beauty. This big cat is full of life and embodies the spirit and drive to achieve and make progress. The tiger represents the greatest earthly power, as well as protection over human life. The sign on this tiger’s forehead spells ‘king’, which is common in most Chinese symbols depicting a tiger. Malaysian-born Kevin Bathman is an artist and graphic designer who has worked in Sydney, Auckland and Kuala Lumpur. Among his projects is The Chindian Diaries, an arts and community project exploring the connection, history and forgotten stories of the Chinese and Indian community. The zodiac symbol of the Tiger can be characterised as enthusiastic, courageous and ambitious. The Tiger is a born leader. Who doesn't love a dog? Artist Song Ling’s mysterious dog is painted in bright primary colours. Floating between past, present and future, it casts its bright, inquisitive eyes upon the world, stopping only to hold up things of importance, so that we might be reminded of their spiritual value. Song Ling received a Bachelor of Fine Arts in 1984 from the China National Academy of Fine Arts. In 1988 he came to Australia and participated in some of the first exhibitions of contemporary Chinese art in this country. He is represented in many public and private collections. Ling has been a finalist in the Archibald Prize (2008 and 2011), Wynne Prize (2010 and 2011), Sulman Prize (2009) and the Blake Prize for Religious Art (2007). The Zodiac symbol of The Dog can be characterised as loyal, smart and sociable. Dogs are a friend to many. The physical allure of the snake is explored in its sinuous form. Inspired by the traditional art of Chinese kite-making, this golden snake flies above the public, representing prosperity and wealth. The artists have also featured the Chinese happiness symbols in the eyes as a symbol of good fortune for the coming year. amigo and amigo, co-founded by Simone Chua and Renzo B Larriviere, is a Sydney-based lighting and design studio that explores the combination of light and sculpture in public spaces. Best known for its large-scale interactive works, amigo and amigo has exhibited extensively in Australia, and recently in Shanghai, China. The zodiac symbol of the Snake can be characterised as private, wise and intuitive. The enigmatic snake has no qualms about putting itself first. A 23-metre long gold, glistening snake. Inspired by the traditional art of Chinese kite-making. Its eyes feature the Chinese character for ‘fortune’ upside down, as a symbol of good fortune arriving for the new year. The 2 Roosters engaged in a dancing fight symbolise their strength and courage in opposing the adversity of the coming year. To highlight the Roosters’ beauty and confidence, vibrant colours feature throughout their feathers. The lanterns tower 8 metres in height, ensuring that these 2 magnificent creatures are the centre of attention. amigo and amigo, co-founded by Simone Chua and Renzo B. Larriviere, is a Sydney-based lighting and design studio that explores the combination of light and sculpture in public spaces. Best known for large-scale interactive works, amigo and amigo has exhibited extensively in Australia. The zodiac symbol of the Rooster can be characterised as honest, energetic and intelligent. The flamboyant Rooster is confident and is not afraid of hard work. Symbolises strength and courage in opposing the adversity of the coming year. The Rooster lantern is presented by Ayam. The Rat lantern is inspired by Guo Jian’s experience of moving to Australia and being embraced and supported by the Sydney LGBTIQ communities. At first glance, the Rat is light, fun and visually entertaining. Look closer and you’ll see the Chinese character for ‘love’ creating a bridge between China and Sydney. Guo Jian first arrived in Sydney in 1992. His provocative work has been exhibited and collected in Germany, France, Belgium, Sweden, the US, Mexico, Australia, New Zealand and China. The zodiac symbol of The Rat can be characterised as intelligent, adaptable and social. The quick-witted Rat cannot let an opportunity to prosper pass them by. The Rat lantern will feature as the backdrop to our fantastic Lunar Lantern community performance groups, every Friday and Saturday evening throughout the festival. Guo Jian’s rats tower 6 metres high. The Rats are inspired by Guo Jian’s experience of moving to Australia and being embraced by the Sydney LGBTIQ communities. The Chinese characters symbolise ‘love’ and create a bridge between China and Sydney. 2,400 hours to build by a team of 10. 500 metres of fabric used to cover approximately 2 tonnes of steel frame. In China, the pig is known for having a lucky and happy character and a sense of humour. In the western world, people say ‘pigs might fly’. This artwork explores both eastern and western notions about this lovable animal. Born in Beijing 1964, John Deng studied architecture and interior design at the China Central Fine Arts and Design Institute. He arrived in Australia in 1989 and lives in Goulburn. He has held exhibitions in China and Australia and his work is held in private and corporate collections. The figure of the Zodiac Pig can be characterised as honorable, philanthropic and optimistic. The Pig can be incredibly focused and achieve great things. The Pig lantern is presented by KIIS 1065. Inspired by the famous chariots unearthed alongside the terracotta warriors of Xi’an, artist Qian Jian Hua reimagines the Horse symbol for a modern Sydney audience. Acknowledging China’s long military history, the Horse lantern depicts ancient war horses leading a chariot. Qian Jian Hua was born in Nanjing and came to Australia in 1991 as a visiting scholar. He now lives and works in Sydney, and his sculptures have been displayed in many major exhibitions in Australia. The Zodiac symbol of The Horse can be characterised as adaptable, loyal and courageous. The always active Horse stands tall in the crowd. Re-imagined for a modern, Sydney audience. Acknowledges China’s long military history. The Horse lantern is inspired by the Terracotta Warriors. Artist Guan Wei’s Loong (Dragon) is a fantastic being of immense power and mysticism, and the emblem of Chinese culture. In this lantern, a little boy retrieves a jewel from Loong’s mouth, enabling Loong to spit water and bring rain to the land. Born in Beijing in 1957, Guan Wei came to Australia in 1989 to take up a residency at the Tasmanian School of Art. His profoundly symbolic work has a moral dimension, his subjects embodying current social and environmental dilemmas. Guan Wei has held 50 solo exhibitions, and his art is held in collections including the Australian Embassy in Beijing, Art Gallery of NSW and Australian National University, Canberra. The zodiac symbol of the Dragon can be characterised as lucky, flexible and eccentric. The charismatic Dragon is as generous as it is powerful. Symbols on each side of Loong signify a relationship with local Australian culture. Discover these 8 playful rabbits practising tai chi with the Sydney Opera House Bridge as a backdrop. Chinese New Year Festival Curator Claudia Chan Shaw invites you to join the circle and try out rabbit tai chi poses, or just wander among these whimsical creatures and get in the bunny spirit. Claudia Chan Shaw is an artist, author and designer for fashion label, Vivian Chan Shaw. Her career spans art and design, photography, curating, broadcasting, collecting and lecturing. She was co-host of the ABC’s popular TV program Collectors. Her work has been exhibited in Australia and is held in private collections. The Zodiac symbol of the Rabbit can be characterised as trustworthy, empathetic and friendly. The Rabbit is sociable, relishing in the company of others. You can join the rabbits and try out the tai chi poses. Each rabbit is 2.5 metres high. A stunning display featuring over 26,000 LED pixels. The majestic Ox takes pride of place in Circular Quay, in a stunning display featuring over 26,000 LED pixels. A nod to the game of mahjong, the 10-metre high Ox is made up of hundreds of illuminated mahjong tiles, projecting an enchanting light and creating a link between heaven and earth. Tianli Zu was born in Beijing and now lives in Sydney. She has exhibited extensively in Australia and China and her work captures her experiences of different places and cultures. The figure of the Zodiac Ox can be characterised as loyal, reliable and strong. The determined Ox is always diligent. 10m high, 10.2m long and 4.8m wide. Over 700 lanterns in the shape of mahjong tiles took a team of 10 over 1,500 hours to complete. Each tile is 650mm by 485mm by 120mm in size. Over 26,000 LED pixels have been used to light up the enchanted beast. The Ox lantern is presented by The Star. Chinatown will be watched by 2 guardian dogs towering 3.8 metres above the street. The pattern and colour of the red and blue dogs reflect the opposite qualities of yin and yang, as well as the happy, celebratory atmosphere of the Sydney Chinese New Year Festival. Fan Dongwang studied at Shanghai School of Arts and Crafts (SSAC) in the 1970s. In 1990 he migrated to Australia, obtaining a Master of Arts at COFA in 1995, and a Doctor of Creative Art at Wollongong University in 1999. The Chinatown Dog Lanterns are presented by Guide Dogs NSW/ACT. The Chinese zodiac is a classification scheme that assigns an animal and its reputed attributes to each year in a repeating 12-year cycle. The 12-year cycle is an approximation to the 11.86-year orbital period of Jupiter, the largest planet of the solar system. It and its variations remain popular in several East Asian countries including China, South Korea, Japan, and Mongolia, as well as in other Asian countries like Vietnam, Burma, Nepal, Bhutan, Sri Lanka, Cambodia, Laos and Thailand, along with the Buddhist calendar. According to one mythical legend, there is a reason for the order of the 12 animals in the 12-year cycle. The story goes that a race was held to cross a great river, and the order of the animals in the cycle was based upon their order in finishing the race. In this story, the Snake compensated for not being the best swimmer by hitching a hidden ride on the Horse's hoof, and when the Horse was just about to cross the finish line, jumping out, scaring the Horse, and thus edging it out for sixth place. The same 12 animals are also used to symbolize the cycle of hours in the day, each being associated with a two-hour time period. The "hour" of the Snake is 9:00 to 11:00 a.m., the time when the sun warms up the earth, and Snakes are said to slither out of their holes. The "month" of the Snake is May 5 to June 5. The reason the animal signs are referred to as "zodiacal" is that one's personality is said to be influenced by the animal signs ruling the time of birth, together with elemental aspects of the animal signs within the sexagenarian (60 year) cycle. Similarly, the year governed by a particular animal sign is supposed to be characterized by it, with the effects particularly strong for people who were born in a year governed by the same animal sign. In Buddhism, legend has it that Buddha summoned all of the animals of the earth to come before him before his departure from this earth, but only 12 animals actually came to bid him farewell. To reward the animals who came to him, he named a year after each of them. The years were given to them in the order they had arrived. The twelve animals of the Chinese zodiac were developed in the early stages of Chinese civilization, over hundreds of years before it developed into the current version; it is difficult to investigate its real origins. Most historians agree that the cat is not included, as they had not yet been introduced to China from India, with the arrival of Buddhism. A Branch may refer to a double-hour period. In the latter case it is the center of the period; for instance, 马 (the Horse) means noon or a period from 11am to 1pm. • Rat (Zishi): 23:00 to 00:59. This is the time when Rats are most active in seeking food. Rats also have a different number of digits on front and hind legs, thus earning Rat the symbol of "turn over" or "new start". • Ox (Choushi): 01:00 to 02:59. This is the time when Oxen begin to chew the cud slowly and comfortably. • Tiger (Yinshi): 03:00 to 04:59. This is the time when Tigers hunt their prey more and show their ferocity. • Rabbit (Maoshi): 05:00 to 06:59. This is the time when the Jade Rabbit is busy pounding herbal medicine on the Moon according to the tale. • Dragon (Chenshi): 07:00 to 08:59. This is the time when Dragons are hovering in the sky to give rain. • Snake (Sishi): 09:00 to 10:59. This is the time when Snakes are leaving their caves. • Horse (Wushi): 11:00 to 12:59. This is the time when the sun is high overhead and while other animals are lying down for a rest, Horses are still standing. • Goat (Weishi): 13:00 to 14:59. This is the time when Goats eat grass and urinate frequently. • Monkey (Shenshi): 15:00 to 16:59. This is the time when Monkeys are lively. • Rooster (Youshi): 17:00 to 18:59. This is the time when Roosters begin to get back to their coops. • Dog (Xushi): 19:00 to 20:59. This is the time when Dogs carry out their duty of guarding the houses. • Pig (Haishi): 21:00 to 22:59. This is the time when Pigs are sleeping sweetly. An ancient folk story tells that Cat and Rat were both very bad at swimming. Although they were poor swimmers, they were both quite intelligent. To get to the meeting called by the Jade Emperor, they had to cross a river to reach the meeting place. The Jade Emperor had also decreed that the years on the calendar would be named for each animal in the order they arrived to the meeting. Cat and Rat decided that the best and fastest way to cross the river was to hop on the back of Ox.Ox, being kind-hearted and naive, agreed to carry them both across. Midway across the river, Rat pushed Cat into the water. Approaching the other side, the Rat jumped off the Ox and rushed to the Jade Emperor. It was named as the first animal of the zodiac calendar. The Ox, came in second. The third one to come was the Tiger. Even though it was strong and powerful it explained to the Jade Emperor that the currents were pushing him downstream. Suddenly, from a distance came a thumping sound, and the Rabbit arrived. It explained how it crossed the river: by jumping from one stone to another in a nimble fashion. Halfway through, it almost lost the race, but it was lucky enough to grab hold of a floating log that later washed him to shore. For that, it became the fourth animal in the zodiac cycle. In fifth place was the flying Dragon. The Jade Emperor was wondering why such a swift airborne creature such as the Dragon failed to come in first. The Dragon explained that it had to stop by a village and brought rain for all the people, and therefore it was held back. Then, on its way to the finish, it saw the helpless Rabbit clinging onto a log so it did a good deed and gave a puff of breath to the poor creature so that it could land on the shore. The Jade Emperor was astonished of the Dragon's good nature, and it was named as the fifth animal. As soon as it had done so, a galloping sound was heard, and the Horse appeared. Hidden on its hoof was the Snake, whose sudden appearance gave it a fright, thus making it fall back and giving the Snake the sixth spot, while the Horse placed seventh. After a while, the Goat, Monkey and Rooster came to the heavenly gate. With combined efforts they managed to arrive to the other side. The Rooster found a raft and the Monkey and the Goat tugged and pulled trying to get all the weeds out of the way. The Jade Emperor was pleased with their teamwork and decided to name the Goat as the eighth animal followed by the Monkey and then the Rooster. The eleventh animal placed in the zodiac cycle was the Dog. Although it should have been the best swimmer it wanted to stay in the water and play for a bit. Though his explanation for being late was because it needed a good bath after a long spell. For that, it almost did not make it to the finish line. Right when the Emperor was going to close the race, an "oink" sound was heard: it was the Pig. "Lazy little Pig" originated from this story. The Pig felt hungry in the middle of the race, so it stopped, ate something and then fell asleep. After it awoke, it finished the race in twelfth place and became the last animal to arrive. The cat eventually drowned, and did not make it in the zodiac. It is said that this is the reason cats always hunt Rats. Another folk story tells that the Rat deceived the Ox into letting it jump on its back, in order for the Ox to hear the Rat sing, before jumping off at the finish line and finishing first. In Chinese mythology a story tells that the cat was tricked by the Rat so it could not go to the banquet. This is why the cat is not part of the Chinese zodiac.